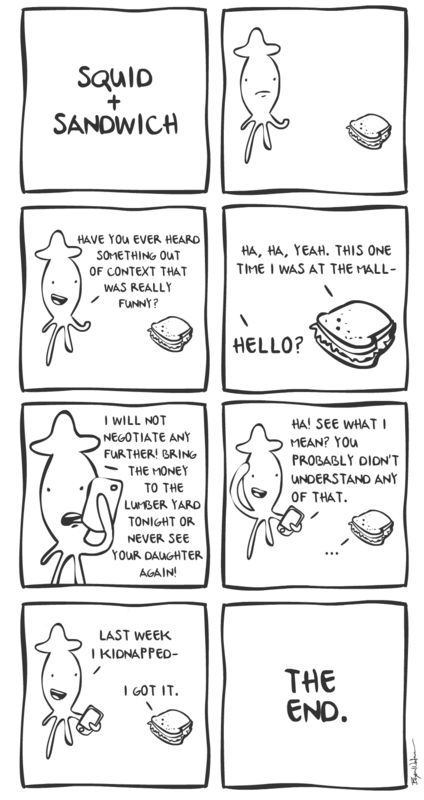 The Squid and Sandwich comic strip debuted on BryanWaterman.com back in March, 2009. Now, the unlikely pair returns to the web with all new comics right here on WatermanStudios.com’s Distractions page. New comics will be released every Monday! Check out their newest comic after the jump. Wonderful! This has long been awaited! It’s interesting that sandwich is left handed in the new comic, judging by the mouse position. Or should I say, left ham-ded. I’ve working for a long time on an education project & just found this fabulous comic. Love it! Need advice/ideas with comic-related art. Concept in a nutshell: SQUID is a mnemonic for helping people learn to make better decisions.